On Tax Bill: 'Genuine Compromise ... May Have Worked' : The Two-Way "Genuine compromise, where every side gives a little at least ... may have worked for one of the first times that I can remember in the House of Representatives," reports NPR's Andrea Seabrook. NPR's Don Gonyea and Andrea Seabrook on the tax bill. There was an interesting exchange about half-way through a conversation today on Morning Edition, when guest host Don Gonyea asked NPR's Andrea Seabrook why Congress has now passed the tax package that President Obama and top Republicans cobbled together "if so many people on both sides of the aisle hated it"? 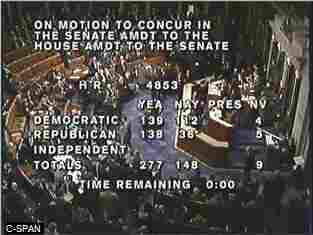 The final tally of the House vote to pass the tax deal struck by President Obama and Republican leaders in Congress. "That's sort of the reason it passed," said Andrea. "Genuine compromise, where every side gives a little at least ... may have worked for one of the first times that I can remember in the House of Representatives." As Korva reported earlier, the House vote was 277 in favor to 148 against. You can see the "roll call" here. The partisan break-down went like this: 139 Democrats and 138 Republicans voted "yes"; 112 Democrats and 36 Republicans voted "no". -- Politico: "Obama Makes The Sale." -- The Wall Street Journal: "Congress Passes Tax Deal; Divided Legislature Adopts Sweeping Measure To Avert Increases, Add New Breaks." -- The New York Times: "The vote sealed the first major deal between President Obama and Congressional Republicans as Democrats put aside their objections and bowed to the realignment of power brought about by their crushing election losses."